UK retailer GAME is to close over a hundred branches in the next three years. 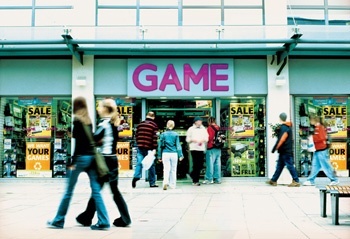 Following a 27% drop in profits, retailer GAME is to close 127 of its 677 UK stores by the end of 2013, reducing the total number of stores to 550. "We continue actively to review our UK store base, with a view to minimizing store overlap and maximizing opportunities from lease expiries, breaks and rent reviews," said GAME chairman Peter Lewis. "Operationally we have continued to derive benefits from the integration of GAME and Gamestation. "We have also rationalized our store and head office cost base which, in conjunction with the store closures, will result in savings of a further 5m GBP in each of the next two years." The announcement of the closures comes at the same time as the announcement that the Chief Executive Officer and Chief Operating Officer would be leaving the company. Interim CEO Chris Bell, said that the company has plans to improve the remaining stores however: "Our stores are a place to experience games, and the format is evolving to cater for their changing needs and the incoming new technology." "We are trialing interactive kiosks and improved ecommerce connectivity in selected stores to expand further the range with thousands more product lines and enhanced the customer experience. To deal with the transactional volumes through our stores, we continually upgrade our IT infrastructure. As part of this we are installing both customer conversion technology and top-up card activation capabilities within our outlets."